A few thoughts on the Celtman Triathlon at Torridon. Piping on Beinn Eighe picture fron Nineonesix guiding. “Alarm at 0300 as I had an early start to head across Loch Shieldaig in The Seaflower to pipe the competitors off on their swim at 0500. My own feelings were high as I walked across Inverbain fileld, down to the loch and towards the Torridon Mountains I see every day. After I had played, the sound of over a hundred swimmers slicing through the water was quite eery, almost like the noise a great sea creature might make. Once back across the loch (by car) I headed down to the shore with my family to watch the competitors come ashore. 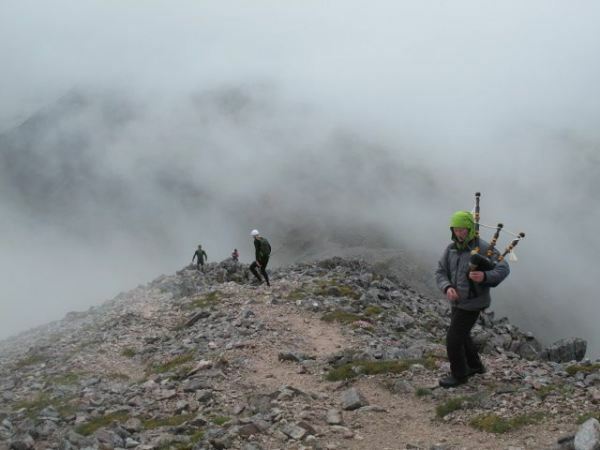 After a quick bite of breakfast I packed my tent, stove and bagpipes and headed for Beinn Eighe. Paul McGreal the creator of this event thought that the bagpipes would help the competitors on their way… By the time I had been blowing them on and off for 3 hours I think the noise would make them run away. My friend John Moffat was on duty at Spidean Coire nan Clach and along with Celtman official ‘Andy’ we kept one another company during the quiet spells. As they arrived the strength, spirit and fitness of many competitors and their support runners was impressive. George, a Greek TV film cameraman joined us later in proceedings to give an internationl feel to the trig point team. Hope nobody sees my piece to camera giving a translation of ‘Spidean Coire nan Clach’! Watching for the runners! Binoculars still one of the finest pieces of equipment for the hill! When you spend along time on the hill especially in one place you tune in to the environment, You hear noises, especially in the mist and at the end of a long day you can estimate how many people to expect and what nationality even in the dark, you get very attuned to all around. You become as one and the wild life and changes in the hill due to weather, light are incredible, the mist and cloud make it a changing scene every minute. 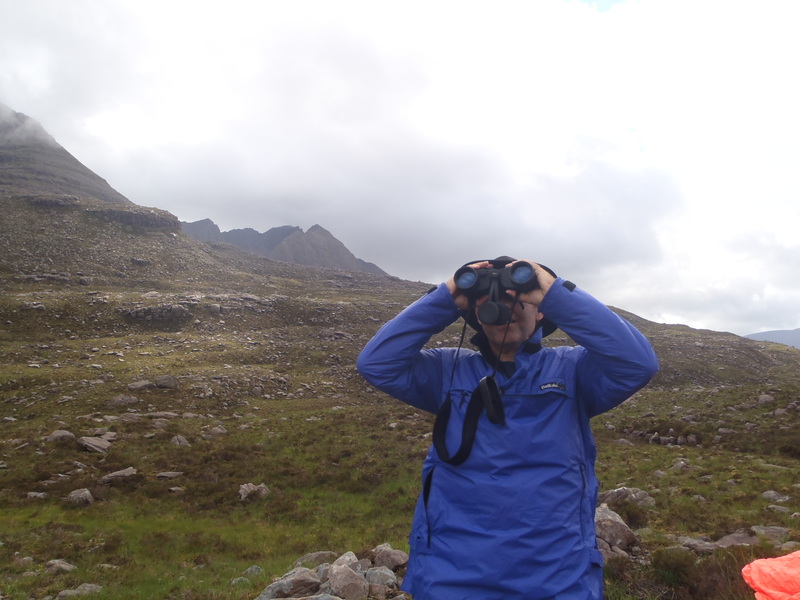 The binocular is a great way to see what is about on the hills. Our check point was where the path bifurcation is for the turn to the cathedral-like Coire Mhic Fhearchair. We were below the incredible prow of Sail Mor a neglected part of the Beinn Eighe ridge and on the other side the great wild Corries of Liathach, These great places have so many memories for me of rescues and great climbs mainly in the winter. The Edinburgh Mountain Bike boys enjoying the wilds of the North West. 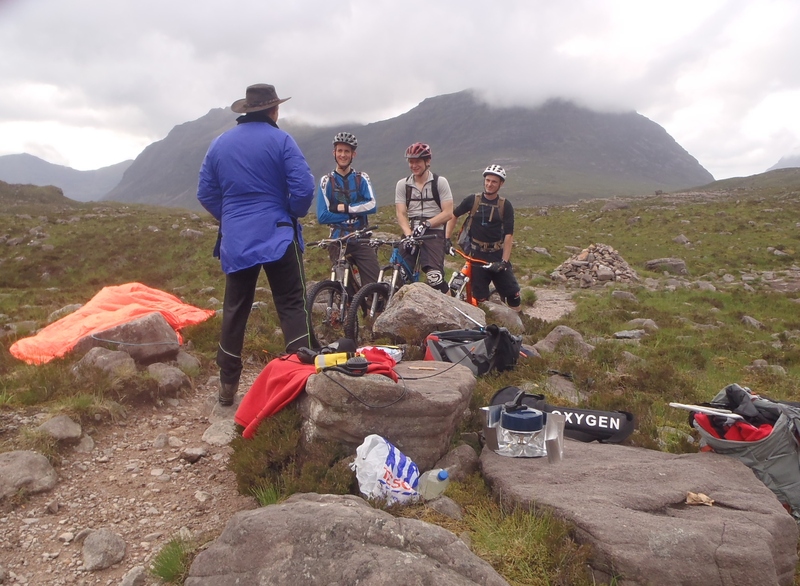 As we were setting up at our checkpoint early in the day we met 3 young guys mountain biking over the Coire Dubh path. We had a great chat and it was good to see others enjoying the wild in a different way.As the day went on we made brews and soup and had so much fun with all the competitors enjoying their trip, so many were from abroad and enjoying this incredible event. As the day/night drew on the weather came in and we helped the last few supporters and competitors off the hill. The flickering torches picking a way along the path, slippy and wet now but all concentrating on the way ahead. I had a few thoughts of those we have helped out in the past after all night rescues and exhausted mountain rescue team members carrying stretchers and helping injured climbers,people we do not even know. What great people we have in our midst. It was a tired group that reached the rain lashed car park in the middle of the night. All had some day and to many it would live with them in the memory for a long time, the work goes on, what a group to be part off! What a day! This entry was posted in Enviroment, Family, Friends, Mountain rescue, Views Political?, Wildlife. Bookmark the permalink.